We're fast approaching the earliest sunset of the year. The sun never gets very high in the sky anymore, and during most of the afternoon the slanting sunlight floods the garage. We're not complaining or anything (which means of course we are), but it's a little difficult to weld in direct sunlight because your self-darkening helmet is always dark. Also, photographs don't always come out so well, because of the contrasting shadows. But the biggest problem is that by 4:00 p.m., just when we're really getting going on the car, the sunlight starts to fade. Not that we can't work on the Locost after dark. We did that all last year. Of course we didn't have a frame back then, and all of our metal was safely wrapped in plastic, so we weren't in such a big rush. And even then, as you may recall, it wasn't a lot of fun. 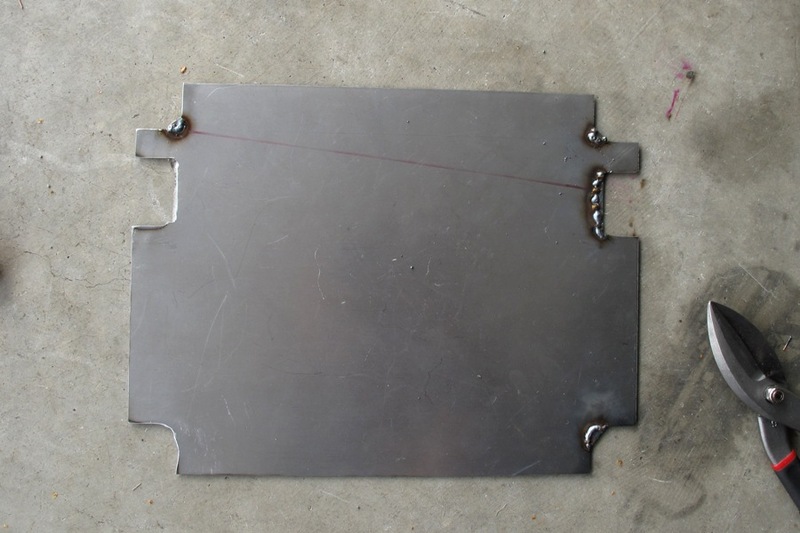 But now we're working on a real car, and we have real stuff to weld. And it's dark out. We've tried welding at night. It just isn't the same. There's not enough ambient light to see very far beyond the puddle, which is way too reminiscent of our early welding days. We also tried grinding at night, and that didn't work any better. Visibility is horrible because the bright sparks completely hide the work, so you're not exactly sure what you're grinding, and you don't want to grind everything. So I think we'll just weld and grind during the daytime, and in a couple of weeks we'll be done with all the welding, and spring will be just around the corner. Firewall is not actually this blue. Lighting. So we're moving pretty slowly, but I think we've proffered some quality excuses there, and so we're okay with it. 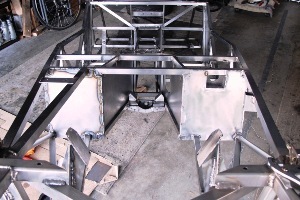 And we've also managed to complete all of our sheet metal work, at least if you don't count the floor. Which admittedly is hard not to count. 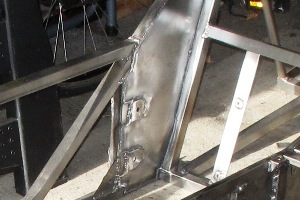 Also, we haven't ground all the seams smooth yet either, which unfortunately appears to be a much bigger job than the actual welding, so when we say we've completed all the sheet metal work, we might be exaggerating slightly. The firewalls went in easily enough. 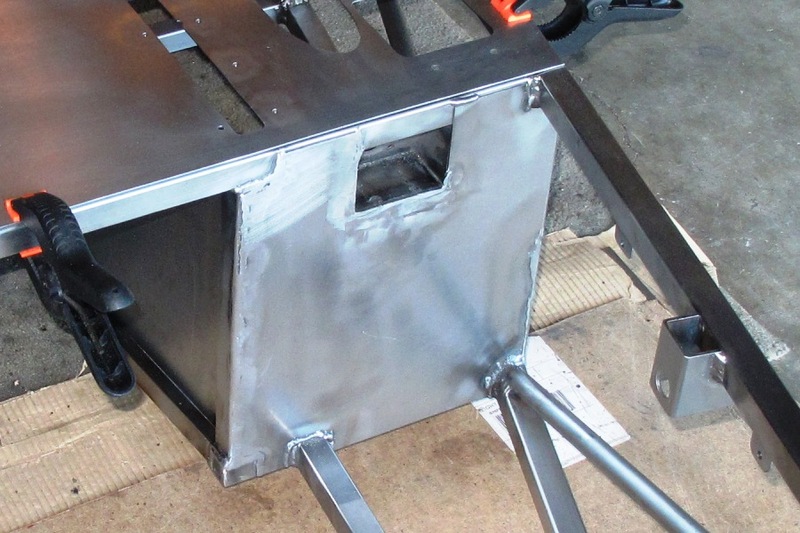 We spent an hour test-fitting and filing away on the nearside firewall to get a perfect fit, and it was a nice fit, but we decided we could save a lot of time on the offside firewall by cutting it to the correct size right from the start. Which was not a good idea. 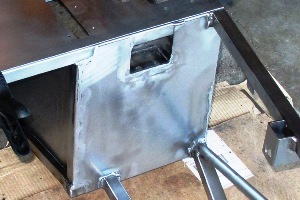 The gaps in the corners were huge, too big to fill in with the MIG torch, so we ended up tacking on tiny bits of 18 gauge steel, and then test-fitting and filing away until the panel actually fit. So it's a little hokey, but when it's all ground down, you'll hardly notice. The rear side panels came out okay. 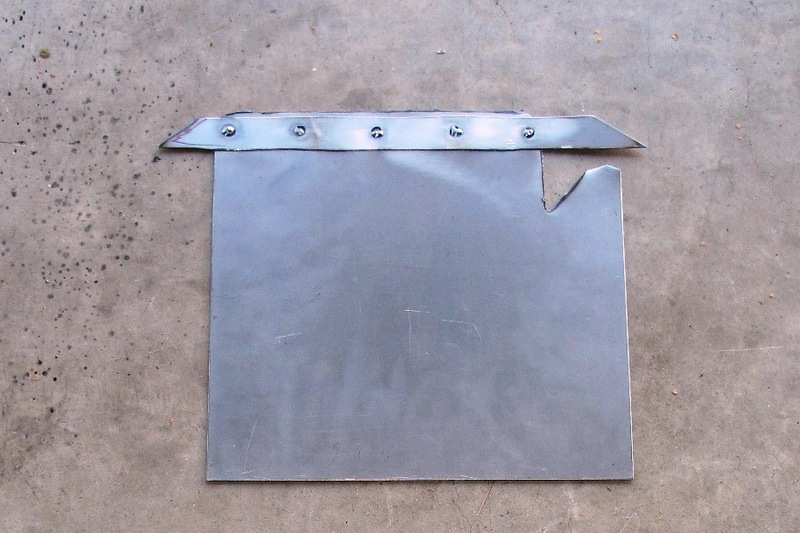 These were the first pieces of sheet metal we cut out, so they fit really well, but welding them on wasn't terribly easy, especially around the rear suspension pickup brackets. We're definitely going to have to find a way to cover them up before anyone gets a good look at the car. Like all the other 20 gauge panels, they're at least extremely rigid if not extremely flat. I doubt they'll help much with chassis stiffness, but they should keep the rear tires from kicking the usual dust, rocks, and debris into the passenger compartment. Yes, firewalls are different sizes. On purpose. So all that's left to do now is the floor. This is the biggest single piece of metal in the car, and it's going to be a challenge to get it welded in without some kind of damage. We're not sure what or who will sustain the damage, but we'll find out. First step in the process will be to cut the floor to fit. We're starting with a 42"x54" rectangle, which is the width and the length of the the cockpit. Metal has to be cut away for the front and back of the transmission tunnel, and then trimmed for the narrowing of the sides of the car up front. We had a helpful tip on our last post about plug welding. 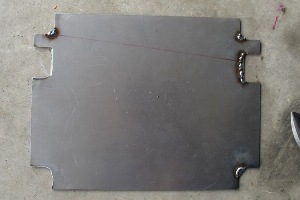 This involves drilling holes around the the perimeter of the sheet metal panel you're trying to weld, for example the floor, and then welding through the holes to the metal underneath. It sounds good in theory, but we're a little leery of doing it on our Locost, for a couple of reasons that have nothing to do with the efficacy of plug welding, and everything to do with our talents as automotive fabricators. The perimeter of our floor is about 20 feet, give or take a foot. We could go out in the garage and measure it exactly, but I think you all know us better than that by now, and anyway 20 feet is close enough. Add to that about 12 feet of interior tubes, and figure 2" spacing on the plug welds, and that works out to around 200 holes. Because of the size of the sheet, the drill press is probably out of play on those holes, so that's 200 holes with a hand drill. Now, there's no question we're going to have to drill holes for riveting on the bodywork, about 500 altogether. But we don't have a choice there. 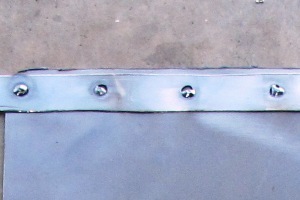 It's aluminum, and we have to use rivets. Here, we have a choice. Drill 200 holes, and fix the dozen or so that we messed up on, and then deburr them all, versus just slapping the floor on there and welding around the edges, no drilling involved. Keep in mind we're not talking about drilling little 1/8" rivet holes, but giant 1/4" plug weld holes. We like the idea of plug welding the interior tubes. 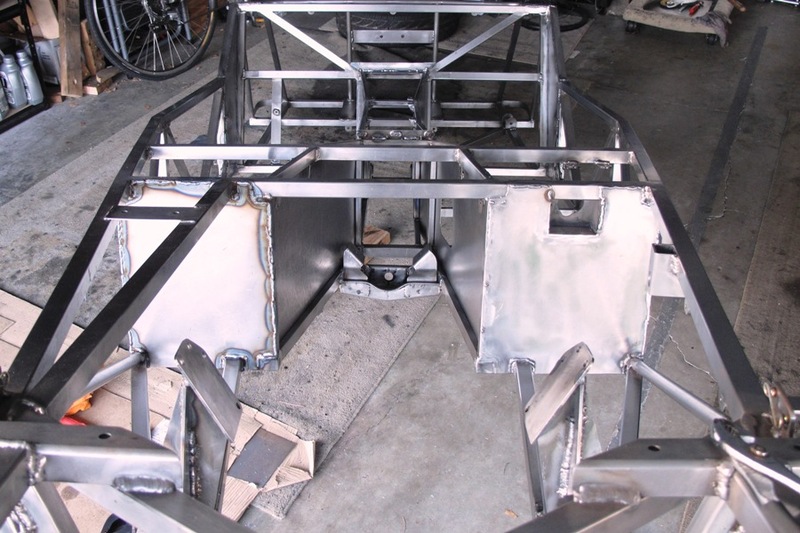 The alternative is welding undercut tee-joints in the unfriendly confines of a narrow Locost footwell, which is not a job for amateurs, or anyone who might be trying to build their welding confidence. Plug welds look like they might be a lot easier. 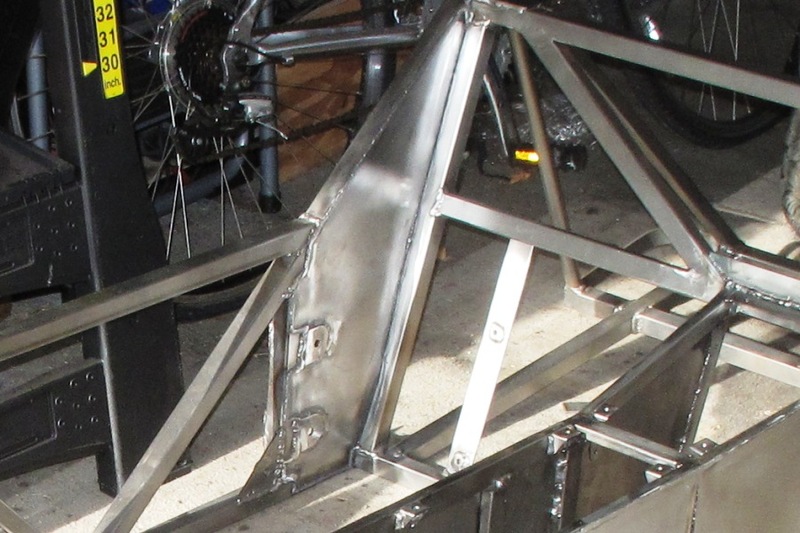 Also, and I can't prove this, but I have a strong sense that a plug weld, being located in the middle of the frame tube instead of along one side or the other, will be less likely to warp the floor into some kind of twisted, lumpy mess. So we'll give it a try, as long as we can get a successful practice run completed, and so long as we can manage to get the holes in the right place. That's actually something I think we may be good at, although you're certainly free to disagree. If our plug welding works, we'll have to thank our anonymous tipster for the hint, and if it doesn't work and we totally mess things up, our anonymous tipster will have think twice about where our talents lie before offering any more useful advice.